This is Part 1 of a 2-part blog on writing silent auction descriptions. 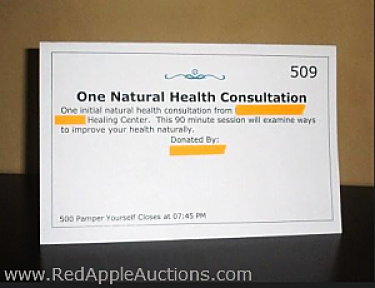 If you’re wondering why some items in your silent auction just aren’t getting the bidding activity you expected, re-read your silent auction descriptions. In almost every silent auction my company attends, we spend some time researching items to find out details. Critical information is often missing. Until that information is known to the guests, they won’t bid. Here are some tips on what seem to be common omissions. 1. In any metropolitan area, guests need to know the suburb, town, or general location of the business. Washington, D.C. commuters have some of the worst traffic congestion in the nation. Locals want to know where something is located before buying. Nobody wants to buy a $40 gift card only to find out the business is a 50-minute commute. I might be interested in buying that gift certificate for bird seed from The Wren’s Nest, but only if I know where The Wren’s Nest is located. Is it within 20 minutes of my home or office? Great! If it’s located 60 minutes away, I might still be interested in buying — but I’ll give it as a gift to my sister-in-law, who lives in that area. And I will bid accordingly. 2. Guests need to know if delivery is included. This is most commonly heard when the item being sold is large, like a piano, playhouse, or holiday tree. If delivery is included or is available for a modest fee, be sure to mention that in the description. Delivery could be the make-it-or-break-it reason as to why a guest bids. 3. Guests must understand if the business service is coming to them, or if they are going to the business service. I might be interested in signing up for a massage session, but only if that massage is available to me in my home, or within a 10-minute drive of my home or office. Outside of that, I’m not bidding. So if the description says, “Jen Smith is a certified massage therapist,” but fails to tell me if Jen Smith is providing these services to me in my home or at her studio, I won’t bid. So many descriptions are too vague. Like what about those services with the home designer? Am I taking my pillow cushions to her at her retail outlet, or is she coming to me? And what about the seamstress who is going to create my one-of-a-kind fitted suit? Am I going to her, or is she coming to me? If she’s coming to me, I’m likely prepared to bid a little more. Continue to Part 2 of writing silent auction descriptions here. And to more promptly start improving your silent auction, skip Part 2 and read below. 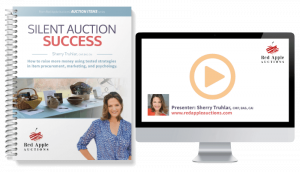 To get my clients to run more profitable silent auctions, I pulled together a nearly 3-hour course that teaches volunteers how to re-vamp their silent auction to raise more money. It’s called Silent Auction Success. When my clients are getting higher ROIs than any other nonprofit around, this product is why. My clients learned the tricks to help an auction perform better while they had fun mastering the psychology of auctions, too. The workbook, recorded training, and downloadable tools give you the bid sheets, display templates, checklists and other tools you’ll need to ensure you raise more money than whoever ran the silent auction last year. It means more money for your cause … be that a school, church, PTO, or some other type of nonprofit. Check it out, cowgirl! Money is just ’round the bend.